What should your engagement or wedding ring budget be? 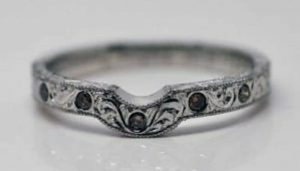 We’d love to be able to give you an easy reference guide to how much you should budget for handmade ethical engagement rings and wedding rings. But that’s really difficult in our kind of business because we don’t sell stock designs off-the-shelf. 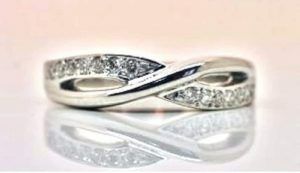 Everything we make is custom made with unique designs, diamonds and gemstones so no two rings are the same. 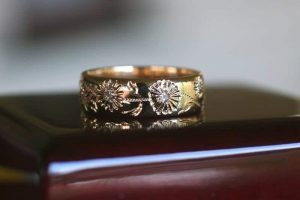 Often that means there can be a really big difference in price between two rings even though they might look very similar. Still, we want to help you as much as we can. So we’ve put together a bunch of examples with price ranges so you can get at least some idea of what your budget should be. 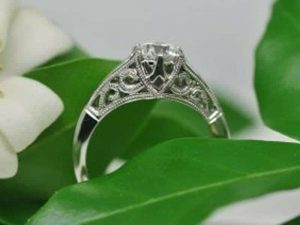 *By the way, for non-ring things like earrings, pendants, cufflinks, bracelets and other types of jewellery, the price depends entirely on the design. Contact us if you’d like us to quote something like this for you. 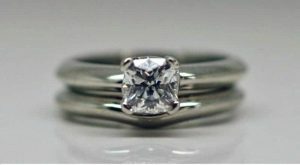 Engagement-style rings are the most difficult to suggest pricing for because there can be so much variation in design. 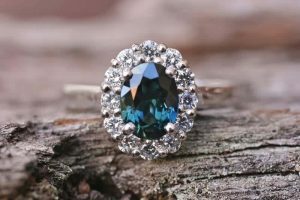 Plus the cost of diamonds and gemstones can often differ by many hundreds or even thousands of dollars depending on the size, number and quality. How much labour will be required to make your ring. 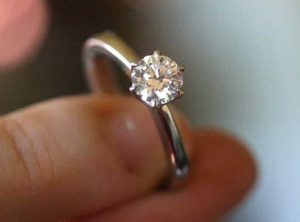 To give you some kind of starting point, the engagement rings you see in this section typically cost somewhere between $2,500 and $7,000. 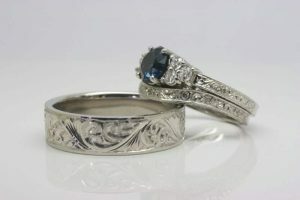 But you could make any one of them cost a lot more by upgrading the quality of the diamonds and gemstones. 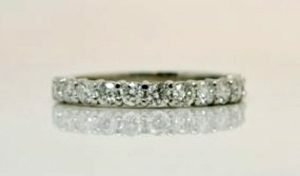 Likewise, on some of the rings you could bring the price down a lot by substituting lab-grown diamonds or gemstones, or by using a diamond alternative like moissanite. How much will the metal and manufacturing cost? Platinum will start at $2,400. For a more complicated design, add another $750 to $1,500 to allow for extra metal and more labour for things like setting more stones, saw-piercing, carving and engraving. How much should you allow for diamonds and/or gemstones? Scroll down to check out the budgeting guides for these items. You can read more about engagement ring pricing in this blog post. 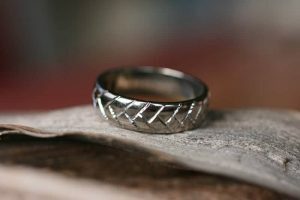 Simple half round or flat wedding or commitment bands are a lot easier to price, even with minor variations like adding a beaten finish, matte finish or wire-brush finish. 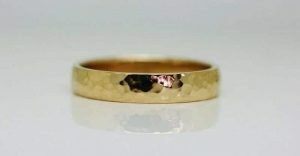 Expect to pay $200 to $350 more than a plain ring for a fitted band. 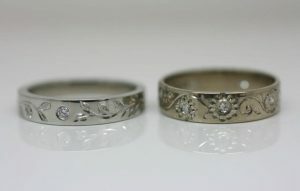 For engraving, fancy shapes and diamond setting please ask for a quote. 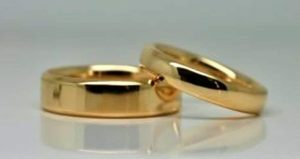 More elaborate wedding or commitment rings are difficult to price because there are so many variables when it comes to design and the cost of manufacturing and materials. 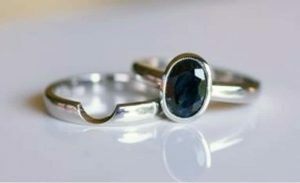 The rings you see below each cost several thousand dollars, yet could be made more expensive by using higher quality diamonds. 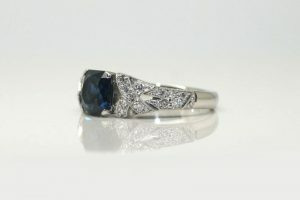 Similarly they could be made less expensive by using diamond alternatives or lower cost coloured gemstones. The best thing to do is ask us for a quote if you have something like one of these in mind. Looking for more ideas? Check out our gallery to get some inspiration. 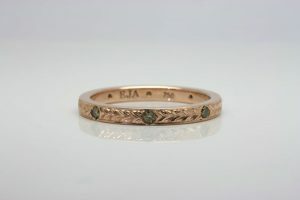 Engraving is often a fairly inexpensive way to add a completely unique dimension to your design. 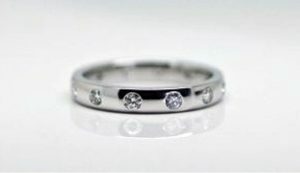 We often suggest it to ‘bling up’ an otherwise fairly plain design and it can often totally transform a ring. Taking it from ordinary to outstanding. Of course, we also often do simple things like include a personal message on the inside of the ring. Highly detailed and precise micro engraving (done under a microscope) is priced on application. Pricing your diamonds is really only something we can do once we know what design you want (colour, shape and size) and what budget you have to work with. Generally we start with your overall budget and then subtract what the metal and manufacturing cost will be. Whatever is left will be your diamond budget. We then work to source you the best possible value combination available. (Taking into account size, clarity, colour and cut). You can learn more about choosing diamonds here. Half-carat Argyle round diamonds are available from around $4,000 depending on their quality. For a one carat Argyle round brilliant diamond you can expect to pay upwards of $10,000 (not only because they’re bigger, but also because they’re less common and more popular). Recycled modern diamonds are usually around 20 – 25% less than Argyle diamonds. Vintage diamonds that are usually old cuts and in off-white colours start at around $1,500 for a half-carat stone. Diamonds that are not colourless (or ‘white’) – are grouped together as ‘fancy colours’. Those at the brown end of the scale (champagne and cognac colours) are relatively common and tend to be less expensive. For instance, Argyle Cognac diamonds of various shapes start at $1,500 for a half-carat. A one carat Argyle Cognac diamond will price from $4,500. Yellow diamonds however, are in limited supply and their prices reflect this. They are similar in price to white Argyle diamonds. Pink diamonds are a luxury item. Pinks over a certain size are often bought as investments as (historically at least) their value rises every year*. The Argyle mine, where most of the world’s supply is found, is expected to run out sometime around 2020, so it’s reasonable to expect the prices for pink diamonds will only increase. Tiny, 1mm diameter pink accent diamonds can start at $800 each. Larger, good quality pink diamonds can be on par with luxury car prices. Larger ones still can easily cost more than a house. Importantly, you’re always welcome to contact us for an obligation free quote. 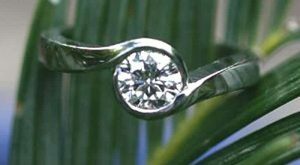 As it is with diamonds, we can really only give you a meaningful indication of price once we know what it is you want and what sort of budget you have to work with. 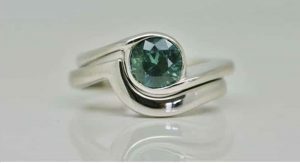 And just as we do with our diamond ring customers, we tend to work out what the metal and manufacturing cost will be first so we can work out how much of your budget is left to spend on the gemstone/s you want. Prices for gemstones vary wildly depending on type, size and quality. Common gemstone varieties (like Amethyst and Aquamarine for example) are relatively inexpensive. 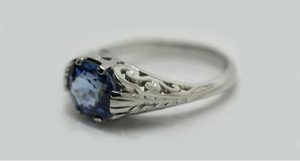 Likewise you might pay only tens of dollars for small, locally produced sapphires. At the other end of the scale you can easily pay tens of thousands of dollars for larger, exotic and high quality gems like Ethiopian emeralds and genuine Russian Alexandrite. In fact, some gemstones (like high quality natural rubies) are more expensive by weight than fine quality diamonds. Throw lab-created gems into the mix and that makes things even more complicated. It really is a “how long is a piece of string” question. 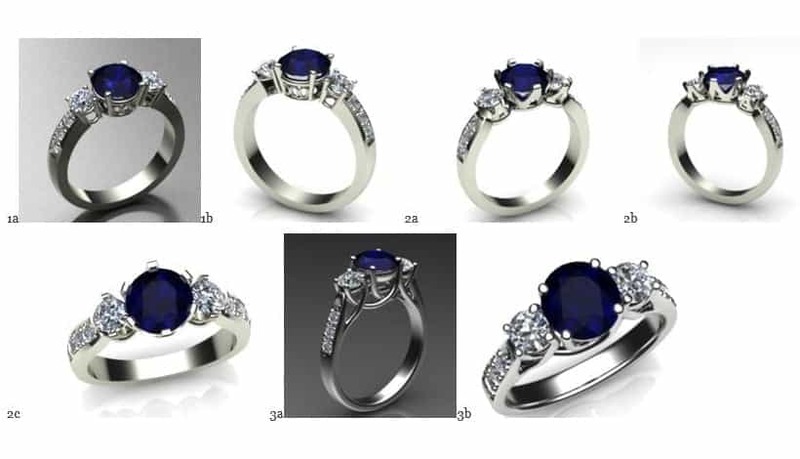 Most of our customers spend somewhere between $1,200 and $4,000 for good quality gemstones (most often Queensland or NSW blue or parti sapphires), but we can easily source much higher quality and more expensive ethically-sourced gemstones is that’s what you’re after. The best thing to do is contact us to discuss what you want and how that will fit into your budget. Ring designs with custom ‘technical’ (or workshop) drawings are free of charge. As is (of course) our advice. If you are looking to design something unique and need to see what the finished product will look like, we can produce a 3D, computer rendered image of the piece you’ve commissioned. This level of design service starts from $275 (technical drawings plus 3 rendered variations of the primary design). For engagement and more complicated wedding or commitment rings, we produce drawings like this so you can check the proportions and other details. 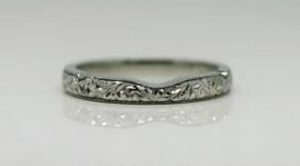 Click on this image to see how the ring turned out. 3D renders are available too. Fees start from $275 – which we will credit back to your purchase when you decide to go ahead. Valuations aren’t essential, but they’re very useful for insurance purposes so you have an independent record of the replacement value of your jewellery piece. 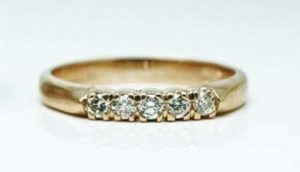 Sadly, over the years, several of our customers have lost their rings – one even destroyed hers in a push bike accident – so insurance is a good idea (it may simply be a matter of adding specific items to your home and contents policy). Independent valuations are $70 per piece (inc. GST). 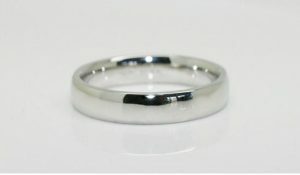 Australia Post, postage and transit insurance for handmade rings is free of charge within Australia. If you prefer a courier, charges can apply. Pick up is available for Brisbane residents by appointment. We do not post outside of Australia unless there are exceptional circumstances. All rings or ring sets come with a beautiful, sustainable timber ring box. 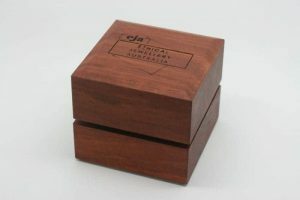 Pendants and other significant pieces of jewellery get a timber presentation box too! To get the design and quoting process underway, feel free to email us (preferred) or give us a call during business hours on 07 3369 2596. 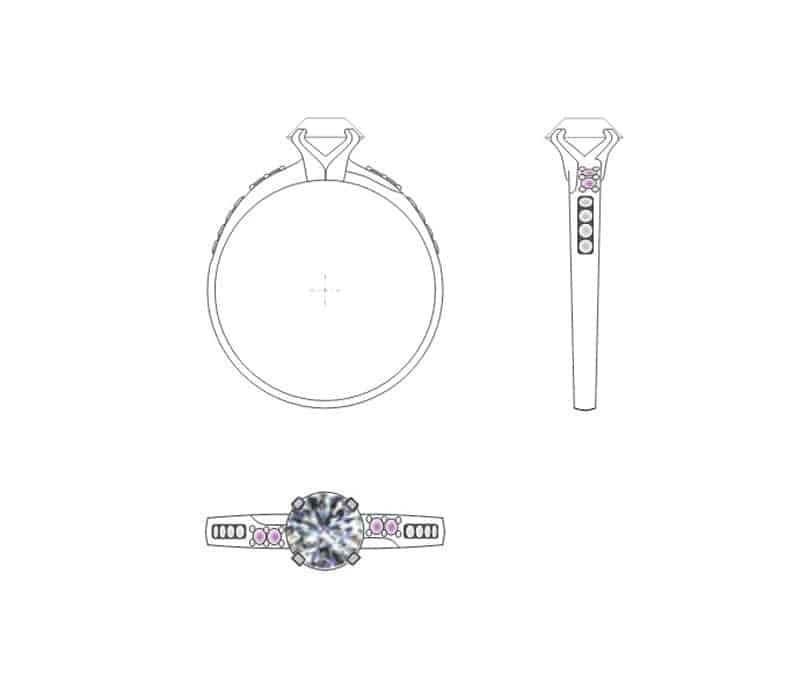 But if you’re not quite ready for that, you might like to download a copy of our Engagement Ring Design Guide.